We are everyday women who at one time found ourselves in challenging circumstances with no smile, but we’ve found our happy place! We all need to know, or be reminded, there is more to life than what we are currently experiencing. We’ll connect and encourage one another through daily inspirational social media resources, blogs, and videos plus our weekly small group, annual “Pop Up” party and “Happy Box” outreaches. You don’t have to be in the struggle alone because there is hope in a growing relationship with Jesus! Something More Enterprises LLC is a faith-based lifestyle ministry whose desire is to encourage all women to know they can live a better life by Opening the Door to Something More through a personal and growing relationship with Jesus. Mom will be blessed to receive our beautifully handcrafted "Beautiful" Mother's Day Gift Box! Inside you will find a mini journal, decorative tea lights, vintage bookmark clips, and an embroidered tea towel all displayed in a reusable wooden crate and made by our Something More team and volunteers. 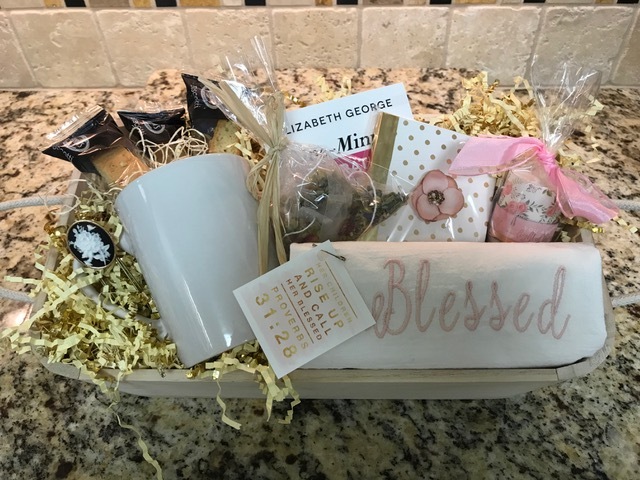 You will also find a tea cup, lavender tea bags, a delicious biscotti and a short devotional to sit with in a favorite cozy spot while sipping a warm cup of tea and enjoying sweet words of encouragement and refreshment. Just click on the payment button below and enter in your contact and payment information. Boxes will be hand delivered or shipped locally inside of the Birmingham, Alabama area. Shipping rates may apply. Proceeds go to fund the production of our Something More Happy Box Ministry. As always, we love and appreciate our Something More friends for supporting our ministry!